If you’re using Outlook for personal and work purpose, then you should also know that outlook can also be used to read RSS Feed. Besides of handling mails and calendars, it also handles RSS Feed, which works great as a Feed Reader. Prior to Outlook 2007, most people used Outlook add-in such as NewsGator to Read Feed. However, Microsoft understood the need and as a result Microsoft integrated built-in RSS Reader in Outlook 2007, which is also available in Outlook 2010. Some Newbie might be wondering what is RSS? 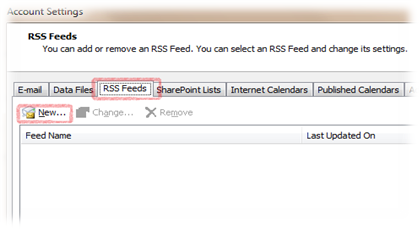 RSS is Really Simple Syndication used to get updates from the website without going to the website or blog. You can subscribe to multiple website and blog and get their feeds at one place. RSS is really a simple way to be updated with latest News and Information. For Example, If you subscribe to the RSS Feed for Techie Inspire, you will be notified when new a post is published on Techie Inspire. 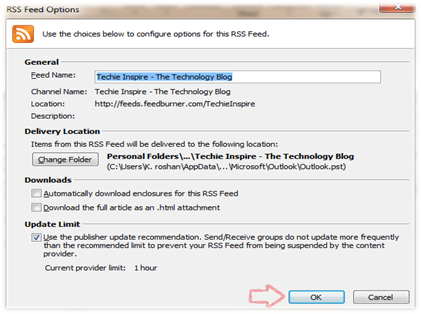 Follow the below steps to use Outlook 2010 as RSS Feed Reader. To use Outlook as your RSS Feed Reader, you simply need to add RSS Feed of your favorite blogs or websites in Outlook to get updates directly in outlook 2010. 1. 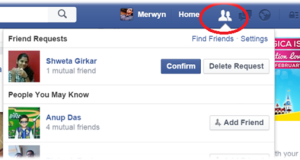 Navigate to File –> Info –> Account Settings –> Account Settings..
3. 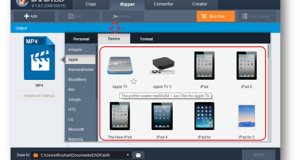 Next, copy and paste the Feed address of blog or website into the address box and click on “Add”. 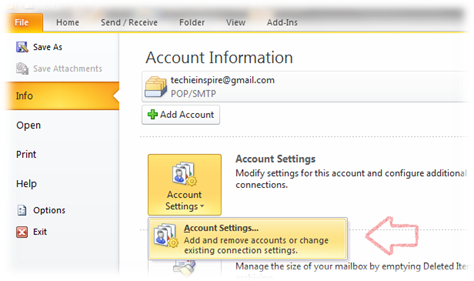 Here, we are adding the feed addresses of Techie Inspire into the address box in Outlook 2010. 4. 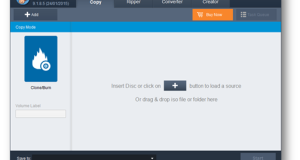 When you click on add, it will pop up an RSS Feed Option window. These are just preference settings, which can be set according to your needs. However, we usually keep it as it is i.e. Default settings. Now Click on “OK”. As seen in the below screen, Outlook is showing the feed of the blog. Now you can view or browse through articles or post feed simply using outlook 2010. Note: The above guide will also work for Outlook 2007.